In returning to Alabama, I have become accustomed to men who believe camouflage anything is a fashion statement, use Bubba as a term of endearment and think macaroni and cheese is a vegetable. I have loved the opportunity to re-acclimate to everything Southern. But it has only been since I have undertaken the “Hand in Glove” project that I have interfaced with true, South-of-the-Mason-Dixon-line Country Boys. Since purchasing our little slice of heaven, our next door neighbor Sandy and her husband Dave, transplanted Birminghamians, have acted as informal caretakers and watch guards over the place between our infrequent visits. Sandy runs a horse farm while Dave commutes back into the city to work with Alabama Power. Sandy shoos off any unwanted visitors to our property – of the two- and four-footed variety – while using her “lady tractor” to keep the pasture closely shorn (most of the time). She does this work happily and we compensate her with countrified holiday decorations, the occasional basket of fruit or potted plants. She has memorized the contours and divets on the land, driving in self-described “crop circles” to ensure she does not run into any geographic peril. 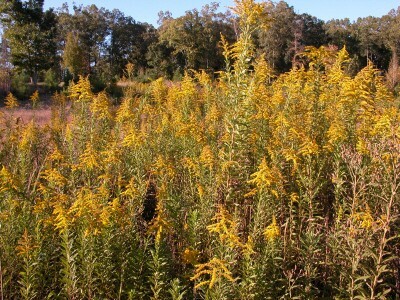 However this fall, the influx of wandering goldenrod was too great even for her little green tractor. When we visited Hand in Glove with a contractor to discuss pouring the foundation, the land looked like the invasion of the goldenrod snatchers. The out-of-control sunshine-hued weeds threatened to engulf not only anything in their path, but also anyone. It was time to bring in someone with some serious equipment to bush hog the property and regain control as we were beginning the build. Sandy suggested we contact Mr. Garrett, a local. She said not to be alarmed upon meeting him, emphasizing that he might not be an obvious choice but was more than capable, having put a new metal roof on their house in the last 12 months. So I called Mr. Garrett and asked him to meet me at HiG. He arrived promptly in his red pick up truck, sporting dusty denim overalls and a craggy, weather-worn face surrounding a smile. Equally noticeable were his rugged hands. While he had a few years on him, there was no question that this was a man who wasn’t afraid of a little hard work. We spoke about my need to clear the land of the pesky goldenrod. Mr. G immediately wanted to bid on pouring the slab. Then I asked the unthinkable — what was his email address so I could send him the plans and allow him to put in a proper bid? “I don’t have one of those. Never saw much need for a computer,” he shrugged. I told him about zambooki.com, my client and partner on this project who could help to advertise his services. I suggested that social media could be a great way to post pictures of his work and get more projects. And though I could sense his hunger for using those hands and that mind to build and clear and shape and construct, the computer and internet thing was really just not for him. Because that’s how these country boys are. The old fashion ways, the original word-of-mouth ways were good enough for him. Posted on Thursday, November 15th, 2012.